April 3, 2018 / Vancouver, BC / NRG Metals Inc. (“NRG” or the “Company”) (TSX-V: NGZ) (OTCQB: NRGMF) (Frankfurt: OGPN), is pleased to announce progress at the Hombre Muerto North Lithium Project ( “HMN” ), located in Salta Province, Argentina. Road and drill pad construction has recently begun at HMN by OneBorax a local heavy equipment contractor. The first road, located at the Tramo Claim Group has been constructed, and work on the first drill pad is being completed. A fifteen-person camp has been installed by Servicios Mineros, and includes insulated buildings, electrical generation and a fuel station supply. Road and pad construction will be ongoing, while drill preparations are being completed. Drilling is expected to start within 10 days. The Company has on site an experienced management team which includes a senior hydrologist and a senior geologist. The HMN project is located at the northern end of the prolific Hombre Muerto Salar, adjacent to FMC’s producing Fenix lithium mine and Galaxy Resources’ Sal de Vida development stage project. 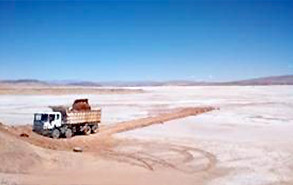 The Fenix mine is the largest producing lithium mine in Argentina, and the Sal de Vida project is the largest development stage lithium project in Argentina. 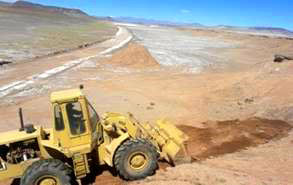 The project comprises mining concessions totaling approximately 3,287 hectares (8,122 acres) and is located 170 km southeast of the provincial capital of Salta. Further details are available at the company website at www.nrgmetalsinc.com, including a recently completed National Instrument 43-101 Technical Report. Further exploration news is expected in the immediate future. NRG Metals Inc. is an exploration stage company focused on the advancement of lithium brine projects in Argentina. In addition to the Hombre Muerto Norte project, the Company is evaluating its 29,000 hectare Salar Escondido project in Catamarca province where the company recently completed a first drill hole that confirmed the Company’s conceptual model of a buried lithium brine target. Further exploration news regarding the Salar Escondido Project is expected in the immediate future. NRG Metals Inc. currently has approximately 111 million shares issued and outstanding, and trades on the TSX Venture Exchange under symbol NGZ, on the OTC QB Market under symbol NRGMF, and on the Frankfurt Stock Exchange under symbol OGPN. The Company currently has working capital of approximately CAD$4.0 million dollars.